The Unlikely Story Of 'Barbar,' A Viral Video From Somali-Born Comic Oomaar : Goats and Soda Millions are watching Barbar, a music video from Somali-born comedian Oomaar. Fans are making their own versions. What's it all about? The music video went up on December 22. It's got all the ingredients to go viral: a catchy beat, smooth vocals and easy-to-copy dance moves. It's garnered over two million views so far and inspired copies around the world. But it's definitely not your typical internet meme. The lyrics are in Somali, and the singer is Somali comedian Omar Said Omar, whose stage name is Oomaar. He was born in Mogadishu, grew up in Galkayo and now lives in Toronto. The song is called Barbar. That's Somali for sideways — because in the video, Oomaar pretends to fall to the side as a dance move. "He's saying that he was in love and then the love just threw him away," says the video's producer, Liibaan Jama, a Somali who came to Minnesota as a child. "The love threw me away like that, sideways." Somalia itself was thrown sideways for many years, cited over and over as the world's leading example of a failed state, mired in conflict and insecurity since dictator Mohammed Siad Barre was ousted in 1991. There was no central government from 1991 to 2006. Pirates attacked ships in waterways off the Somali coast. In October, a truck bombing in the capital Mogadishu took more than 300 lives, "the deadliest single attack Somalia has ever faced," according to its Ministry of Humanitarian Affairs and Disaster Management. In addition, Somalis also contend with food shortages fueled by drought. And the GDP per capita was $450 in 2016. Yet Somalis are resilient and hopeful. Somalia's fragile government is struggling to rebuild the country and there are encouraging signs. 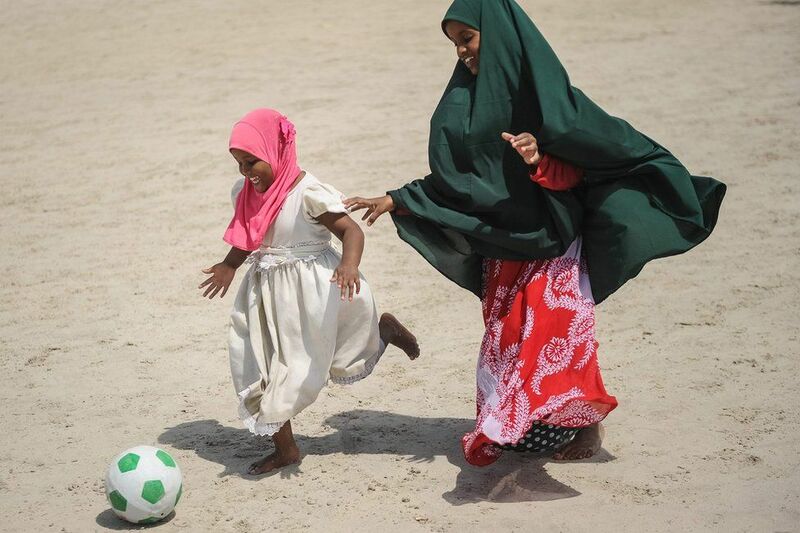 Despite all their troubles, Somalis are enjoying everyday life, playing footie (soccer) on the beach in Mogadishu, for example. In December, the president of the Somali Football Federation announced plans to host international soccer matches in 2018, the first time since 1988. And now there's the Barbar video. It isn't spreading a political message. It's simply meant to be fun. And many people — Somalis and non Somalis — are enjoying it. "Mostly the Somalis are political animals, and we like all things politics," says Hassan Abukar, a Somali cultural commentator who lives in the U.S. and works as a court interpreter. "This new song is basically taking us away from any discourse in politics, all these divisions that as a community we always talk about." Plus there's the novelty effect. "There is a Somali saying that says people like what's new, so probably that's one of the reasons that many people like this song," says Abukar. That saying, wixii cusub caalamkaa jecel, translates to "What's new in the world?" Inside jokes add to the video's appeal. In certain cuts, Oomaar wears a windbreaker labeled "hooyo," the Somali word for mother — in the same font popularized by American streetwear brand Supreme. It helps, too, that Jama already has a following as a video producer, making songs and videos with friends for several years in Minneapolis, where he lives. But it's always hard to know what will take off on the internet. Jama had no idea Barbar would be such a hit, especially considering that the video came together in about a day. A friend, Mowliid Curjin, had written the lyrics, Jama did the audio and video production, and Oomaar threw in the dance move of falling sideways. "I never even thought it was going to be that popular," Jama says. Not everyone thinks the video deserves attention. Some critics have raised the idea that religious sermons, not dance moves, should be going viral; a few clerics and religious groups have posted their own videos speaking out against the popular song. But that hasn't stopped Barbar. In fact, in Somalia, in other countries on the continent and in the African diaspora, imitators are playfully throwing themselves out of chairs, into pools and onto piles of snow. They've uploaded hundreds of videos to YouTube and Facebook, from Kenya, Djibouti and Minnesota. Even government employees have been drawn in. "The Barbar wave reached the Embassy," the United States Embassy in Djibouti wrote last Friday, "and we couldn't resist."